Top of the line, Top of Their Game, You Cant Top It! Bohol Fun Divers offers an abundance of marine life – The reef systems are stretched over several kilometers on the Panglao coastline. View some of our recently captured photographs of the Dive Centre, Accommodations and underwater shots and videos! To our one-stop ‘PADI 5-Star Dive Resort’ (always in top condition) located at the heart of the 800 – meter stretch Alona Beach within the premises of the beautifully landscaped and newly renovated Lost Horizon dive resort main and the new Lost Horizon Annex resort 5min to walk from the beach. Our facility opened its doors early February 2008 at the beachfront. MANAGEMENT: President/CEO: Holger Horn, PADI Master Instructor, Emergency First Response = EFR Instructor Trainer, German. 17 years of diving experience within the Philippines and 15 years scuba diving business experience. Manager: Rena Sugiyama, PADI Master Scuba Diver Trainer, EFR Instructor, Japanese. 16 years of diving experience within the Visayas region and 13 years scuba diving business experience. 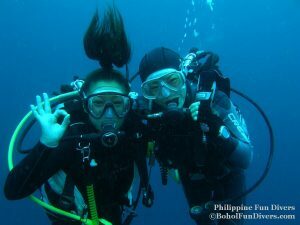 Secretariat: Inquiries, reservations, billings and staff supervisor: Ana Liza G. Mandin, Filipina, and Open Water Diver with 11 years SCUBA business experience and Mary Flor Magallanes who is now 5 years with us. INSTRUCTOR TRAINER, INSTRUCTORS, ASSISTANT INSTRUCTORS, DIVE MASTERS AND GUIDES: All professional staffs are renewed PADI professionals with continuing education program and updating themselves with all important SCUBA diving changes. All of our instructors work full time and have certified several hundreds of students in all levels. 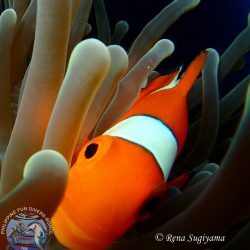 Our guides are very experienced with thousands of dives within our area and beyond. 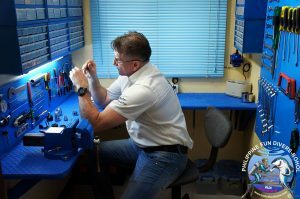 Our management team, secretary team, instructor team, dive master team, boats crews team, compressor operator team and maintenance team are highly trained, pleasant, environmental-conscious and always approachable.